Valarie J. Dunning, age 60. Sunrise October 20, 1958 and Sunset January 24, 2019. Visitation 6:00pm and Funeral 7:00pm Friday February 1, 2019 at MARLAN J. GARY FUNERAL HOME, THE CHAPEL OF PEACE NORTH 2500 Cleveland Ave. Sharing your sadness as you remember Valerie. To the Dunning family. My heart is with you and your family at this time of your loss. There is comfort in knowing God’s promises about the resurrection hope. (Acts 24:15) and (John 5:28,29) In the past God has resurrected humans and He is eager to do it again because He hates death. (Mark 5:41-43) To learn more about God’s promises go to JW.ORG. There are online Bible study lessons featured and more. Love Your Neighbor Irish J. Richardson. To my Big Brother Michael, you have my most sincere condolence , that Heavenly Angel will never leave your side, I will keep you and the family in prayer. Heaven has truly gained an angel with your arrival. You will forever hold a warm place in our hearts. We will always cherish our memories with you. Rest In Peace Val. I know you are with your Family now. Blessings to the entire Dunning Family. 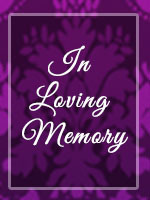 Sending our deepest sympathy, prayers and love. We will miss you Val. Rest in Heaven.